East River operates under a multi-tiered energy delivery system. 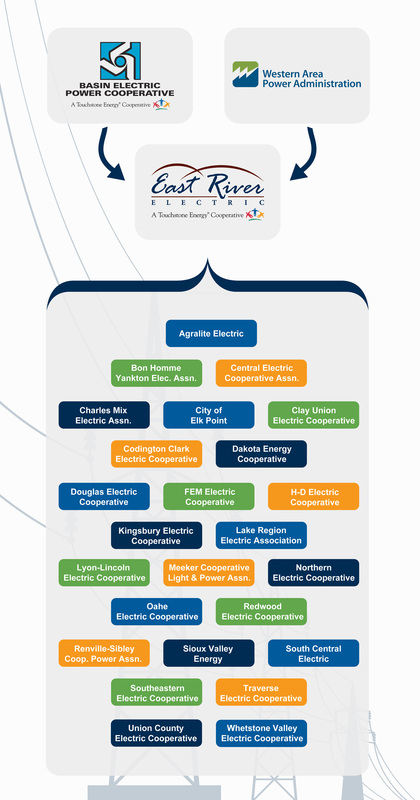 Our cooperative network is designed to provide safe, affordable and reliable power to our member-owners. Basin Electric Power Cooperative generates and transmits wholesale power to member rural electric cooperatives in nine states. Western Area Power Administration (WAPA) provides wholesale, renewable hydro-power from Missouri River dams to East River. East River receives power from Basin and WAPA and delivers it to 24 member electric cooperatives and one member municipal utility in eastern South Dakota and western Minnesota. Distribution Cooperatives in East River’s service territory distribute the power to their member-owners for retail use. East River took the strategic step of joining the Southwest Power Pool (SPP) in 2015 as a Transmission Owner along with Basin Electric Power Cooperative and the Western Area Power Administration. SPP’s mission is to help their members work together to keep the lights on, today and in the future. SPP was founded in 1941 when eleven regional power companies pooled their resources to keep Arkansas’ Jones Mill powered around the clock in support of critical, national defense needs. Today, SPP oversees the bulk electric grid and wholesale power market in the central United States on behalf of a diverse group of utilities and transmission companies in 14 states. SPP ensures the reliable supply of power, adequate transmission infrastructure, and competitive wholesale electricity prices for a 575,000-square-mile region including more than 60,000 miles of high-voltage transmission lines. Visit to www.spp.org to learn more about the Southwest Power Pool.